Every county and state in the country has a “first” or “most famous” 4-H event, person or place to commemorate and this is your opportunity to “Put it on the Map!”For years, 4-H History Team members have been asked “Where was the first 4-H club in the U.S.? Where is the longest continuously-active club in the country? Where was the first African American 4-H camp in the country? Where was the first Native American 4-H swine club in America?” and so on. Now those 4-H History Landmarks can be recorded and tracked as a result of the National 4-H Geospatial Leadership Team’s National 4-H History Map project. This will give every county a chance to nominate the “first” and “most important” 4-H places, people and events (we’re calling all of these “sites”). How do you nominate a historically significant 4-H location/person/event in your community? Since July, 2014, the 4-H Geo-spatial Leadership Team has established a website where you can access information about the project. Right now there is a promotion poster and data collection sheet on the site at: http://goo.gl/vGF9nt. Fill out the data collection form right on the website. If you don’t have all of the data requested, fill out what you can and a Geo-spatial Team member will contact you. 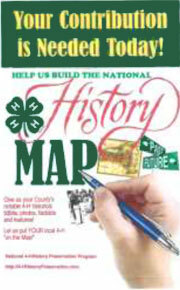 The vision of the 4-H History Map team is a national atlas of the United States to be posted on the Internet early in 2015. This map can then be accessed using desk top computers, as well as portable units such as laptops, smart phones and tablets. As a 4-H family travels, they can search in advance for locations near where they will travel or use their portable device when on the road. Curious as to where this idea cam from? Every July, a team of youth and adults known as the 4-H Geo-spatial Leadership Team work together for a week in San Diego, California. Each year, this team provides guidance and recommendations to 4-H National Headquarters and National 4-H Council for new efforts to advance learning about GIS, GPS and Remote Sensing technologies. as a part of this recommendation, the youth/adult team suggests a project that will help introduce the use of geo-spatial technology to 4-H families. Jim Kahler and Tom Tate, of the National 4-H History Preservation Team, also serve as members of the 4-H Geo-spatial Team. The 2014 4-H Geo-spatial Team’s recommended two-year project is this 4-H History Map, which would provide members, leaders, alumni, staff, and volunteers a tool for documenting historically significant 4-H locations/people/events in their own community, county or state. This entry was posted in History and tagged 4-HHistory, 4-HHistoryMap by Larry Krug. Bookmark the permalink.